Over my many years practising acupuncture, the list of conditions or reasons that have brought them through my door has been long and varied. But one has loomed large above the rest: pain. Anyone who’s lived with persistent or chronic pain will know only too well the misery it brings. The physical symptoms can be bad enough, but there’s a psychological and emotional dimension to ongoing pain that eats away at our resilience and sense of inner balance. I know, because I see it on an almost daily basis. It’s hard to pin down exactly how many people currently live with chronic pain, largely because the definition of pain in this context is so subjective. The British Pain Society (BPS) puts the number of people living with severe daily pain in the UK at around 10m, while a study in the British Medical Journal published in 2016 puts that figure at closer to 28m, or 43% of the population. And pain doesn’t just have a personal cost – high though that certainly is. It also takes its toll on the economy. The BPS estimates that close to 10 million working days are lost to rheumatoid arthritis alone, whilst the cost to the NHS of treating general back pain amounts to around £5bn annually. Whichever way you slice it, pain contributes significantly to our personal and corporate wellbeing – and one of the things that always worries me is just how many people there are out there who’ve been led to believe they have no option but to live with it and just manage it through prescription drugs. From the conversations I have with my patients, I know just how demoralising the prospect of a life in permanent pain can be – so my mission is to do what I can to help the people I treat to have a different future! While there certainly some people whose condition is so chronic it can never be fully cured, I also know there are lot of people who live with pain unnecessarily and perhaps aren’t aware of the non-clinical options that are available – acupuncture among them.. But regardless of which category you might fall into, acupuncture offers an effective and trusted option for relieving pain completely – or, if your condition won’t allow that, reducing it to a point where your quality of life can be significantly improved. Acupuncture has long been a recognised and credible treatment for pain of all types. And why wouldn’t it be? This, after all, is the most ancient of all known treatments, dating back to the very beginnings of modern man (as I always say, if it wasn’t effective, you’d think people would have worked it out by now and it wouldn’t still be such a big part of contemporary medical practice). 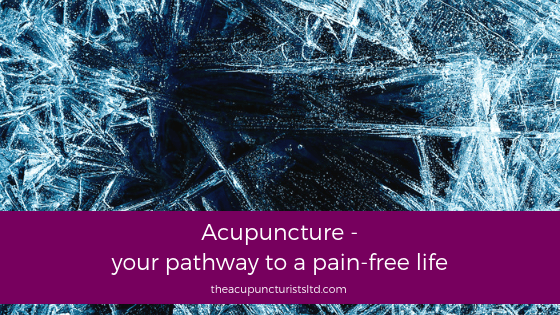 In fact, acupuncture for pain is a common and recognised alternative approach to pain treatment and management and many clinicians – from GPs to consultants – refer to acupuncturists to help those patients who will benefit from additional non-clinical care. So, what is it that acupuncture can offer but conventional Western medicine can’t? One key reason perhaps is that it is concerned with the body’s natural energy, or qi, and the treatment of the cause of a condition rather than the symptoms or the location in which pain is manifesting itself. Ancient Chinese therapy, and particularly acupuncture, focuses on the energy pathways that link our organs, turning the human body into an intricate energy roadmap of sorts. Key to the success of acupuncture for pain relief is the knowledge that where a patient feels discomfort is often – indeed, likely – not the place where the problem is to be found. That means we often focus on an area that, for the patient, is totally unrelated to what they’re experiencing yet which is inextricably linked to the pain they feel. So what types of pain can acupuncture treat? Well, apart from the obvious musculoskeletal issues that acupuncture is well-known for relieving, such as back, neck, shoulder and joint pain – it’s also brilliant for getting to the bottom of headaches and migraine. In fact, if you feel any sort of pain, acupuncture can, in most cases, probably resolve it. Most people know how acupuncture works in practical terms – the painless insertion of very fine, slender needles into the body at specific locations – but it’s how the insertion of those needles stimulates the body’s natural healing processes and promotes renewed wellbeing that makes the therapy so amazing. But it’s not just the traditional art of acupuncture that we use in our clinic. One of the fascinating aspects of this ancient therapy is the way it evolves to reflect modern demands, challenges and technology. If you’d like to learn more about what we do, please have a look through our website. And if you know someone who’s suffering with pain and might be interested in putting acupuncture to the test, please share this article with them and encourage them to get in touch for a confidential chat!